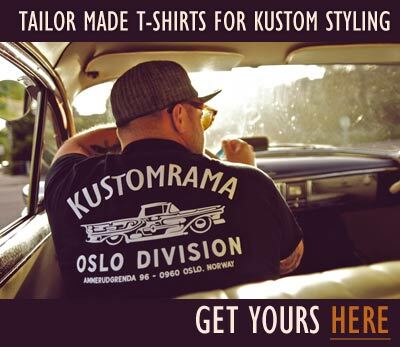 Please get in touch with us at mail@kustomrama.com if you have stories and photos to share. Feedback, input and corrections are also welcome. Richard Torres' 1951 Chevrolet 1951 Chevrolet originally owned and restyled by Richard Torres of Lawndale, California. Richard was attending the El Camino Jr College when he had the car, and he did not belong to any of the local car clubs. Ray Furgal and Ron Seaver's 1941 Ford Convertible Built from a wrecked convertible, Ray and Ron were stationed in Tokyo, Japan when they built the car. The completed build was featured in the "Letters" section of Car Craft January 1955. Bill Cole's 1929 Ford Model A Roadster 1929 Ford Model A roadster owned, built and raced by Bill Cole of Redlands, California. Bill was a member of the Strokers of Whittier, a car club that was very active in SCTA in the late 1940s and the early 1950s. 03.05.2019 - The Restored Golden Sahara Unveiled at the 2019 Geneva International Motor Show In March of 2019 Goodyear and Klairmont Kollections unveiled the restored Golden Sahara II at the 2019 Geneva International Motor Show. The restored version of the iconic custom featured translucent Goodyear tires. 02.25.2019 - Cody Burghdorf Completes the Krimson Kart Restoration Cody Burghdorf has just completed the restoration of Emory Ashpaugh's Krimson Kart. A restoration he started in 2016. The restored version of the car will make its debut at the 2019 Detroit Autorama. 01.27.2019 - The Michael Gale Black Estate Sale Legendary East Coast customizer Richard "Korky" Korkes' 1954 Ford Parisienne custom is coming up for sale in the estate sale after Michael "Gale" Black in February. Looking for info: Thomas Dannerbauer's 1929 Ford Thomas Dannerbauer of Bayern, Germany recently purchased an old Hot Rod from Lodi, California. Little of the history is known about Tom's roadster. 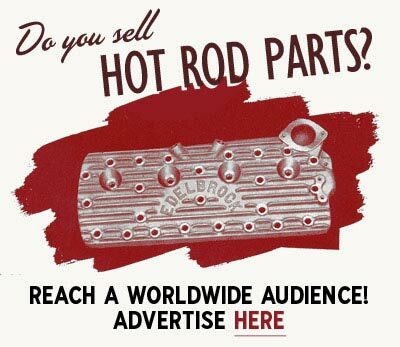 It shows traces of several stages of being hot rodder throughout the years. It has been parked since the 1980's and the known history is long gone. Looking for Info: The New York Mystery Sport Custom US built Sport Custom, currently located in Italy. The car was purchased in New York in the late 1980s or early 1990s. The buyer found it for sale on Hemmings, and all he remembers about the guy he got it off was that he was a physician in the Syracuse, New York area. Looking for Info: Don Ellis' 1955 Ford Thunderbird Dennis Bradford's 1955 Ford Thunderbird custom was featured in the June 1959 issue of Rod & Custom Magazine. The story was named "Trimmed with Taste," and the author of the story compared the appearance of the car with the appearance of a limited production vehicle such as the Facel Vega. The Jerry Drake Collection Jerry Drake of Lansing, Michigan is a legendary pinstriper known as "Spider the Crazy Painter." Among some of Jerry's highlights was scalloping Carl Casper's 1951 Chevrolet, "The Exotic Empress," that went on to win the Nationals in 1961, and David Cassidy's Touring "T", that Carl Casper built for Screen Gems. Jerry was also a Show Director for Carl Casper for over 12 years. The Ken Bausert Collection Ken Bausert grew up in a two-story house in Richmond Hill, New York’s borough of Queens. A 25-minute drive on the Belt Parkway separates Richmond Hill from the Flatbush neighborhood in Brooklyn. Queens is the easternmost and largest in area of the five boroughs of New York City. It is geographically adjacent to the borough of Brooklyn at the southwestern end of Long Island and to Nassau County farther east on Long Island. The Junior Conway Collection While Olav Kvipt lived in California, he was able to become friends with Junior Conway of Junior's House of Color in Bell. Junior has been in the trade since he began working for Barris Kustoms in 1955, and is currently operating one of the best, high end body shops in the world. The majority of the photos from Junior's collection are from 1953 to the late 1960s. Matt Townsend ranks the 3 greatest 1949-51 Mercury customs of all time Matt Townsend runs Townsends Customs & Hot Rods, a custom body shop in Riverside, California that specializes in restoration and customization of classic cars. In November of 2017 Matt had 17 1949 - 1951 Mercury customs under his belt, so we asked him what his All-Time Top 3 1949 - 1951 Mercury Customs are. Kevan Sledge ranks the 3 greatest customs of all time Kevan Sledge is a founding member of the So. Cal Shifters car club. Kevan has had a passion for cars since he was a young kid, and began building hot rods and customs as a hobby in the late 1980s. In 2011 he started up Sledge Customs, turning his hobby into a full time profession. Gene Winfield ranks his top 3 favorite builds Gene Winfield is a legendary customizer, painter and hot rod racer. Born June 16, 1927, Gene has been restyling cars since 1945, and he is one of the best known and most recognized builders in the world. They say choosing your favourite build is like choosing your favourite child! We Gene what his top 3 favourite builds are? For Sale: Joe Wilhelm's Wild Dream Wild Dream is a show rod designed and built by Joe Wilhelm at Wilhelm's Custom Shop for John Hernandez. Built over a three year period, the wild rod featured a futuristic hand-formed aluminum body that was covered with 20 coats of purple metalflake paint. For Sale: Roy Abendroth's 1955 Buick Century - The BuSonic Known as the "BuSonic," Roy Abendroth's 1955 Buick was restyled by John Schott over a three year period. Completed in 1963, the list of modidications included canted quad headlights, hydraulic lifts and a sparkling Copper Metalflake paint job by Larry Watson. For Sale: Frank De Rosa's 1966 Buick Riviera "The Golden Piranha" Frank De Rosa has been cutting up and customizing cars since 1943. In 1949 he opened up De Rosa Custom Body and Fender in Pittsburg, California, a shop that still is in business, operated by the De Rosa family. Frank has now turned 91 years old, and he has decided to sell off one of his old builds. Grand National Roadster Show 2019 The 70th annual Grand National Roadster Show was held January 25 - 27, 2019 at the Fairplex in Pomona, California. Over 500 show vehicles competed for awards inside the Fairplex buildings. Another 400-800 vehicles joined the event Saturday & Sunday for the Grand Daddy Drive-In. A-Bombers Old Style Weekend 2018 The 22nd annual A-Bombers Old Style Weekend was held August 3-5, 2018 at Backamo Lägerplats in Uddevalla, Sweden. Coupe Devils Rod & Kustom Bonanza 2018 The 10th annual Coupe Devils Rod & Kustom Bonanza was held June 15-17, 2018 at Bruvollen in Blaker, Norway. Lawrence Garrison's 1940 Mercury Convertible In 2011 Birger Meland of Lier, Norway bought Lawrence Garrison’s channeled 1940 Mercury from Pat Orosco in California. For a long time, the history of this old custom has been full of holes and rumors. In June Birger told us that he wanted to restore the car back to how it was originally built. 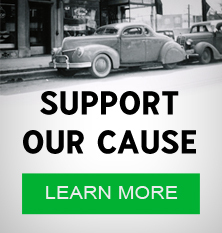 We applauded the initiative and agreed to help him research the history of the car. Gil Ayala's 1955 Ford Thunderbird - The Wild Bird Gil Ayala's personal custom, a 1955 Ford Thunderbird, known as the Wild Bird, has been sold to Scandinavia. Gil's Thunderbird is one of the few known surviving Ayala Customs, and it is a great addition to the Scandinavian custom scene. The restoration. We followed the restoration of the car, and it's trip halfway across the world on Kustomrama. The Kustomrama Dream truck The Kustomrama Dream Truck is a tribute to the custom cars of the late 1950s. Being an admirer of Jerry DeVito's wildly restyled 1957 Ford Fairlane, that we all know as the Maze, Sondre Kvipt decided that he wanted to recreate this car as a Ranchero. The build was started in Oslo, Norway in January of 2014, lead by Sondre's brother Olav. Featured Video: The 1957 Norwalk Motorcade A movie by Bob Stephenson from the 4th annual Norwalk Motorcade, an outdoor car show sponsored by the Norwalk Coachmen car club. Keith Christensen was the first President of the club and a founding member. Featured Video: AutopiaLA: Jerry Moffatt's 1939 Ford Los Angeles Custom Shawn Davis of AutotopiaLA takes the historic Jerry Moffatt's 1939 Ford Convertible for a spin. Featured Video: Warren Dorrill's Shark - 8MM Home Video 1949 Ford Club Coupe owned and restyled by Warren Dorrill of Gallup, New Mexico. Warren was a well-known bodyman and painter, and his 1949 Ford custom was known as "The Shark." Filmed back in the 1950s, this 8mm video comes from the collection of Warren's family. 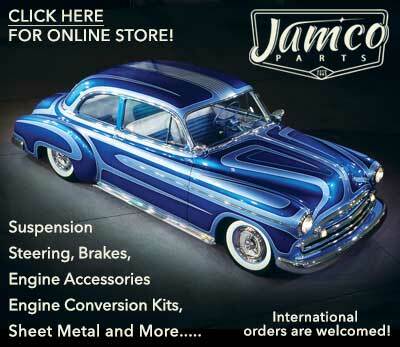 Subscribe to our newsletter and receive updates on Main Page and other subjects featured on Kustomrama. If you have additional information, photos, feedback or corrections about Main Page, please get in touch with Kustomrama at: mail@kustomrama.com. This page was last edited on 17 April 2019, at 03:58.